Turkey will solve the terrorism problem in northern Syria with its own hand if Washington's strategy toward PKK-linked groups, which started under Obama's term, does not change, President Recep Tayyip Erdoğan said Sunday. Speaking to the press before heading to India in his first official trip since the constitutional reform referendum, the president said that Turkey is concerned about the presence of U.S. flags flying beside the flags of the PKK's Syrian offshoot, the People's Protection Units (YPG), at convoys in Syria. He also noted that he will discuss the matter with President Donald Trump on May 16 when they meet. "This needs to end. Otherwise we will have to take the matter into our own hands," Erdoğan said, adding that Turkey will have to continue attacks against the YPG in the Karachok region in Syria and Sinjar in Iraq. He highlighted that the Turkish military may intervene at any time soon, adding, "It is better for them to live in fear than us being worried [about terror attacks]." Turkish-U.S. relations were strained during the Obama administration due to Washington's support to the PKK's Syrian offshoots in northern Syria under the guise of the anti-Daesh fight. Despite Ankara's repeated calls on Washington to carry out the Raqqa operation together, the U.S. continues to cooperate with the YPG instead of its NATO ally. 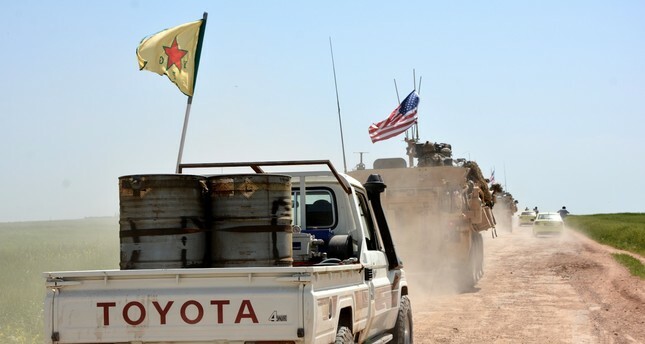 People's Protection Units (YPG) terrorists stand near U.S military vehicles in the town of Darbasiya next to the Turkish-Syrian border, on April 29. Turkish military forces on last Monday carried out airstrikes on PKK targets located on Mount Sinjar in Northern Iraq and Mount Karachok in northeastern Syria. According to sources within the Turkish General Staff, targets were hit to prevent the terrorist group from sending terrorists, arms, ammunition and explosives to Turkey, resulting in the deaths of 89 terrorists, including four high-level terrorists. Ankara has long been warning the PKK to withdraw its forces from the Sinjar area. Earlier this week, President Erdoğan said in an interview that there are approximately 2,000 PKK members present in Iraq's Sinjar, stressing, "We cannot allow this to become a second Qandil," and asserting that Ankara needs to "drain the swamp." Following Turkish airstrikes, U.S. forces have started to patrol part of the Turkey-Syria border together with the YPG terrorists. Both Sinjar and Karachok are located some 90 kilometers (56 miles) south of the border with Turkey. Also, during a speech on Saturday, Erdoğan noted that an effective fight against Daesh cannot be carried out using another terrorist group, urging the U.S. and its partners in the anti-Daesh coalition to reconsider their support for the YPG-dominated Syrian Democratic Forces (SDF). Since Donald Trump's election as U.S. president, Ankara presented two expectations to the new government in order to fully recover bilateral relations that were seriously damaged during the Obama administration. Along with the extradition of the leader of the Gülenist Terror Group (FETÖ), Fetullah Gülen, the mastermind of failed July 15 coup attempt who has been living in Pennsylvania since 1999, Turkey remains adamant in its request for the U.S. to cease support for PKK-linked groups in northern Syria.President Erdoğan also spoke about a possible reshuffling in the Cabinet, saying the decision is at the disposal of the government and not him. "The prime minister and the current government have authorization regarding the issue. But, as you know, having a stable and consistent government is a Turkish tradition. We have a high-functioning government and an increasing economic trend already," he said, adding that Ankara's primary goal is to maintain confidence and stability in the country. Earlier this week, Prime Minister Binali Yıldırım signaled a reshuffle of the Turkish Cabinet, including changes in key posts. "From time to time, fresh blood in the Cabinet is a democratic necessity," the prime minister said during an interview with Bloomberg on April 24. Yıldırım, however, did not provide any further details or names of those who could take up positions in the Cabinet. Erdoğan also noted that Turkey aims to strengthen cooperation with India in many ways, highlighting that both countries have many things in common. "We will hold extensive meetings with Indian officials and business people," he said, adding that the visit will focus on the counterterrorism fight, cooperation across the business sector and the closure of FETÖ-linked schools in India. The president will be in India for a two-day visit and is scheduled to meet with Indian Prime Minister Narendra Modi and other officials. He will also participate in the Turkey-India Business Forum.